Ms. Ralbag serves as an external director since January 2018. 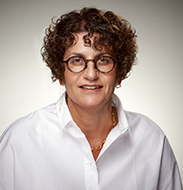 Ms. Ralbag has served as CFO of the Shaare Zedek Medical Center in Jerusalem since 2011, and previously served as Deputy Director of Medical Finance at the Tel Aviv Sourasky (Ichilov) Medical Center (2009-2011), Head of the Hospital Administration and Deputy Director General of Planning, Budget and Pricing at the Ministry of Health (2004-2009), VP and Head of Commercial and Retail Banking Division at FIBI (2001-2003). Ms. Ralbag also served, among other things, as Acting Chairperson of the Board of FIBI Mortgages Ltd. for a period of 4 years, Acting Chairperson of the Board of Atzmaut Mortgage Bank Ltd. for a period of 4 years, a Director at Sarel Ltd., a Director at ARAM Provident Fund, and presently serves, among other things, as an external director at Hachsharat HaYishuv Insurance Ltd., SoHo Realty Ltd. and Golf & Co. Group Ltd. Ms. Ralbag holds a BA in economics and business administration and an MBA in public policy, both from the Hebrew University in Jerusalem.